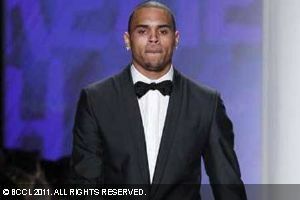 Singer Chris Brown calls his new album ” F.A.M.E” , a triumph as the success of the track proved that his career is not over. Brown’s latest album debuted at the top of America’s Billboard 200 chart in March, marking Brown’s first ever number one record. “I don’t really think it’s a comeback album. I feel like it’s an album of triumph, like an underdog type of album. It’s more of me showing and proving everybody wrong. I don’t think I ever went anywhere,” dailystar.co.uk quoted Brown as saying. “I recognise my music touches people and everything I do negative or positive affects people all over the world. So that’s definitely a blessing and a curse,” he said. The “Run It!” singer admitted he feels pressurised to live upto people’s expectations. “The thing I dislike most about my life is living up to everybody’s expectations, never being able to be like, ‘F**k it,’ and do what I want to do, not care about someone’s opinion. As artists we’re opinionated, but we definitely do care about the public’s opinion because that’s our consumer,” he added. The R&B singer was convicted for assaulting his then girlfriend Rihanna in 2009, after which his career nosedived and since then he has been trying hard to regain his popularity since the last two years.